Firstly, we would like to wish you all God’s richest blessing for this next year. We give thanks to him for all his goodness to us over the past twelve months. 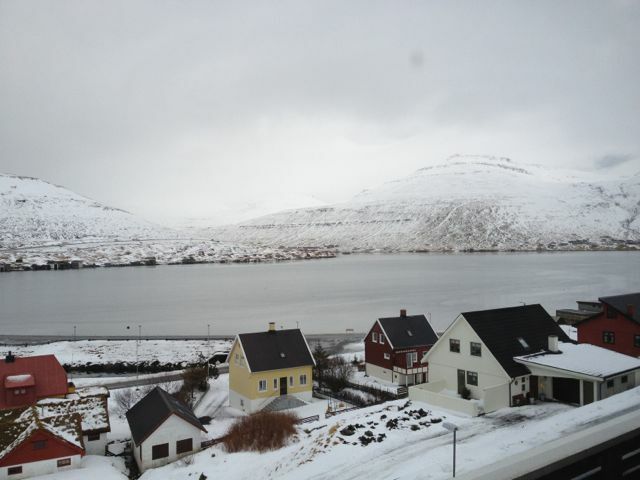 We have been in the Faroes now for a few weeks and are staying until 19th January when we start the journey back to Motherwell. It was great to be able to spend Christmas and New Year with Dorit’s family. Simon has been working on his masters, finishing one essay last week with the main dissertation still to come. The essay was more difficult than it needed to be as he left all the notes he had made for it back in Denmark! He wasn’t happy when he realised this. There are, though, worse places to have to spend time studying. There is a marvellous view (see above) from the desk – at least when it isn’t blotted out by fog or snow storms. The latter have been a bit of a feature of our time here so far. We have had the privilege of joining with a number of assemblies in the Faroes already and will be visiting others over the next couple of weeks. A list of engagements can be found on the “Speaking” page of this site. While it is always a privilege to be able to share God’s word with people, one of the main aims of our visits is to let people know a little about what we will be doing at Tilsley College once we start there in February. We are also keen to raise the profile of GLO in the Faroes. While a lot of people from the islands have attended the college (there are three Faroese students there this year) there have been fewer people who have been involved in summer outreach teams: one of GLO’s main ministries. Details of the teams for 2012 can be found here. We would like to get Faroes people of all ages involved in these teams, so please do pray about that. We’ve had a number of views on the Exeter house, but no offers yet. There are also a few issues which need to be sorted in order for us to complete the purchase of the house in Motherwell. These are both other items for prayer. As is our journey back. We were delayed a couple of days and had a longer than planned ferry crossing due to storms on our way over. It would be nice to avoid the same on the way to Scotland!